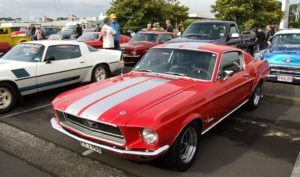 First generation Ford Mustangs were produced from 1964 through 1963, dropping the 1968 Mustang squarely within this generation. A few small changes were incorporated into this iconic pony car design every couple of years by the Ford Motor Company. In ’67, the classic Mustang was made larger, while keeping the same overall design. The expanded size was largely a response to the larger engines, with slightly larger interiors and cargo spaces to match. 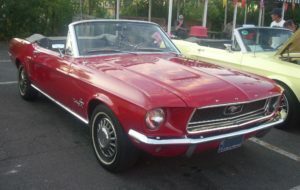 The 1968 Mustangs held to the larger size with only a few small design changes. According to The Classic Mustang, the grille was restyled without bars to show a floating emblem, sleeker lines were created by a cleaned-out side scoop, and the block lettering on the side plates was upstyled to elegant script writing. Front and rear side markers were also added to this model, due to the introduction of some Federal regulations that were new for 1968. The 1968 Ford Mustang was wildly popular, with, according to Old Ride, a total of 317,148 produced. The production run breaks down to: 24,376 convertibles, such as the red one in the top image of this article; 42,325 2+2 Fastbacks, like the red and silver striped one featured right above this; and 249,447 hardtop coupes, like the two-tone gold one shown below. Fifteen different exterior color options were available on these powerful muscle cars. Seven different engine options were offered in the ’68 Mustang, with horsepower ranging from 120 in the V6 up to 390 horsepower in the 427 V8 engine. Interested in Buying or Selling a Classic Ford Mustang? 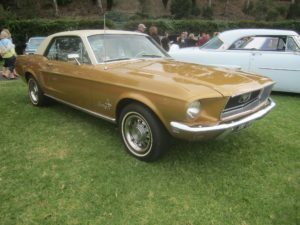 Part of the reason Classic Cars Online US exists is to help connect classic car buyers and sellers, and we’ve added several ways for you to connect, but first, be sure to visit the Classifieds page if you’re in the market to buy or sell classic cars such as the iconic 1968 Ford Mustang.